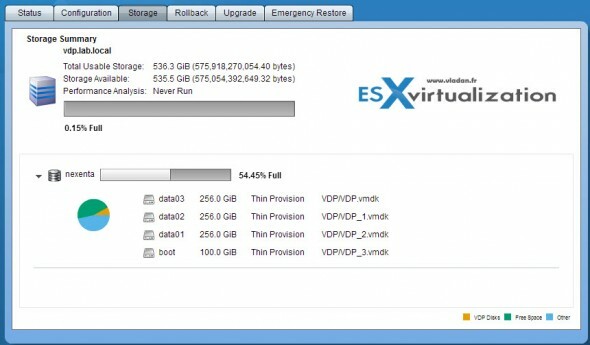 After vSphere 5.5 release, users of VDP might look for How to upgrade VDP? The latest update of vSphere Data Protection (VDP 5.5.1) brought new features and enhancements that I have reported on in my article here – VMware VDP 5.5 and VDP Advanced – With a DR for VDP. If you do not know VDP as a product at all, you can check out my VDP 5.0 install/config serie details. This serie starts here and gives you all necessary info how to plan, deploy, configure and use VDP product. What's been Improved in VDP 5.5.1? Disk level Granularity – allows backup/restore individual VMDK (virtual disks). Restore directly with ESXi (if vCenter is not available) – by going to https://<ip_of_vdp>/vdp-configure you can access to Emergency restore tab where you can trigger restores. (VDR had this feature too). First, you need a VDP upgrade ISO which is possible to download from within your VMware account. (note it's not available for trials). 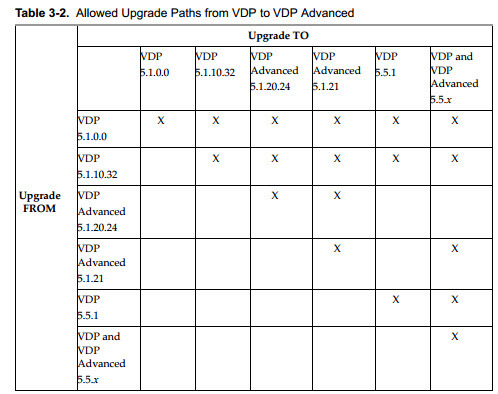 Attach this ISO to the VDP appliance, because if you don't you can't do the upgrade. Reboot the VDP virtual machine with the ISO attached at boot. Shut down the VDP VM and take a snapshot. Strat up the VDP VM again with the upgrade ISO connected. Connect to the VDP admin interface through https://<ip_of_vdp>:8543/vdp-configure and go to Upgrade TAB. Make sure that the maintenance services are stopped…..
Make sure that all the services are running. Wait for the ISO to mount (I had to wait 4-5 min !!!!!). Click on the message to select the upgrade and the click upgrade VDP. But according to the Admin Guide this is normal. Otherwise there is no message…. Now VDP is performing an Integrity check, and preparing packages for installation. Actually, it goes quite fast. The message saying that it could take up to 4 hours was quite scary, but as my VDP haven't had many VMs (or backups) configured, the upgrade process takes less time. After upgrade is complete, delete the snapshot and disconnect the upgrade ISO. VDP upgrade must be done outside of the maintenance window. It means that you must reschedule existing backups or wait when no backups are running. Note: If you're running more than one VDP appliance (8TB of data per appliance in VDP 5.5), while upgrading you might see two plugins – one for 5.x and second one for 5.5. You might have to disable the VDP 5.x plugin. Again, it's in the manual, it's a must read doc, especially when VDP is your production backup system. After upgrade you'll see two VDP plugins in vCenter. ( Even if you don't have other VDP appliances in your environment = My case). This is normal behavior as you need the old plugin just for the managing the rest of your VDP appliances which weren't upgraded yet. Not to worry about. Just go and click the Home button > Administration > Client Plugins > Right click the VDP 5.0 or 5.1 plugin to disable it. I think this is new as I can't remember this view concerning the storage. 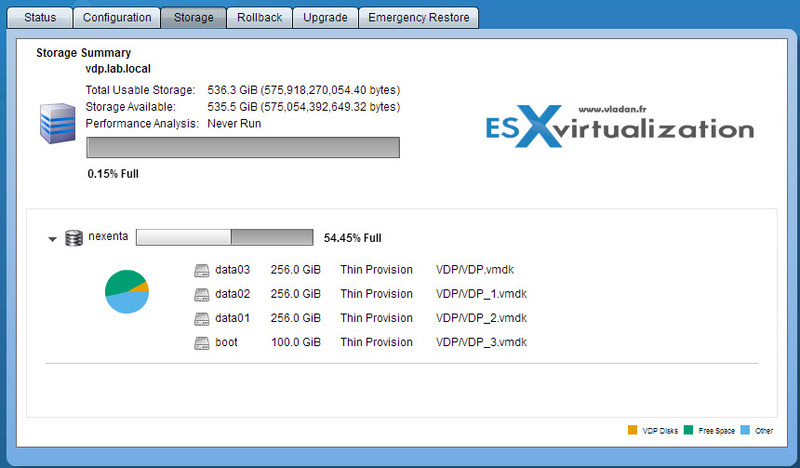 You can see how much storage is used and which disks are attached to the VDP appliance. Note: When using emergency restore, you can see not only the vCenter VM (if you backed up previously) but also other VMs.. In my case I only have single backup of one single VM, because I've setup the VDP 5.0 yesterady to be able to do the writeup for upgrade to 5.5 release…. Links: VDP 5.5 Admin Guide at pubs.vmware.com URL which has all vSphere and vCloud Suite Documentation sets. This website is often copied as I provide RSS feed for my regular readers. But I often spend some hours to track the rippers and pirates, but I guess it's just the other side of the success? You can subscribe via RSS for future posts, follow me on Twitter @vladan or enjoy coming back every day as this site has daily updates.. -:).